The statement (original French version here) is deeply disappointing, showing that this Marxist political association continues to draw all the wrong conclusions from the grave attacks against the people of Ukraine, attacks that have escalated over the past four months. We can only hope that the Fourth International will correct its course. Opposition is growing in Ukraine and internationally to the right-wing regime that came into power in Kyiv in late February, to its war in the east of the country, to the suppression of democratic rights taking place throughout Ukraine, and to the key support role of the NATO military alliance. The past four months have seen the Kyiv regime launch a war on the population in the south-eastern provinces in order to block progressive demands for political and economic autonomy, including the demand for provincial governors to be elected instead of appointed. The autonomy movement is also driven by the threat posed to the region’s economy by an economic association agreement that the regime in Kyiv has now signed with the European Union. The regime has also accepted International Monetary Fund-dictated austerity measures. These were a condition of loans it asked for and began receiving in March. The association agreement will see the abolition of protective tariff barriers for agriculture and industry. It will disrupt and weaken Ukraine’s considerable trading relations with Russia. Already, Ukraine has lost the discounts on natural gas imports that Russia was providing before the overthrow in late February of Ukraine’s elected president. The dream of closer ties to Europe is predicated on the belief that cheap labour costs in Ukraine will bring large-scale investment from the West. Supporters of closer ties also argue that the dropping of tariff barriers will make existing Ukrainian products competitive. But Europe is beset by economic stagnation. Large quantities of European goods lack buyers. There is little incentive for European capitalists to invest in modernising Ukrainian industry when their own products have trouble finding markets. Further, demolishing Ukraine’s tariff walls will do little to boost export sales if the country’s trade offerings do not correspond to European tastes, or if quality is inadequate. Attractive European products, though, will flood across the border into Ukraine, driving local producers out of business. Ukrainian agriculture, which … requires a high degree of processing, cannot withstand competition with European manufacturers, whose competitiveness is supported by huge subsidies, non-tariff regulation and flexible mechanisms. Disruption of economic ties with Russia and countries of the Customs Union will destroy the industry built on the basis of cooperation in the framework of the former USSR. Tight EU monetary requirements in the field of "budget savings" (similar to the requirements of the IMF) will force the Ukrainian government to cut social spending, which will aggravate the social situation in the country. For the mass of Ukraine’s working people, the effects of the association agreement are likely to amount to an economic holocaust. To this onslaught by Western imperialism against Ukraine’s status as an industrialised country, the Fourth International statement devotes a total of just four lines. Much more important, according to the statement, are the supposed menaces to Ukraine of the Russian state – whose bail-out offer of loans and energy concessions last November included no austerity measures at all. 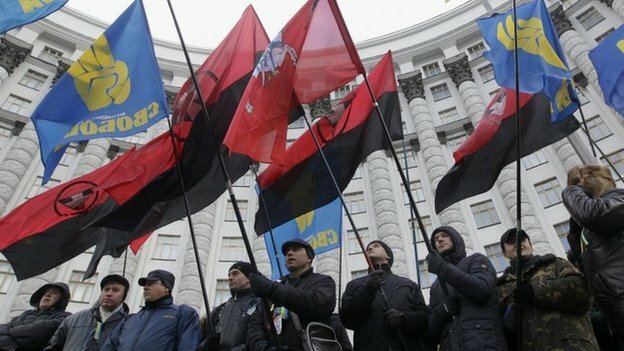 The rise of violent, ultra-right political currents in Ukraine is a concern of the first order. Representatives of ultra-right parties have served as ministers in the government, at times controlling the ministries of the police and armed forces. (See note below on current situation.) Fascist gangs attack left-wing political groups with impunity, and are organising militias to fight alongside the Ukraine army in the east. Some even direct army operations, as in the city of Mariupol in early May. Trade unions in Ukraine are under attack. On June 26, a right-wing mob attacked a meeting in Kyiv of the Federation of Independent Unions (video here). Astoundingly, the Fourth International statement of June 7 says nothing about the war in the east. The regime’s assaults have caused hundreds of deaths and the displacement of tens of thousands of people. Pro-government neo-Nazi militias stage attacks on working-class communities with authorities making no detectable moves to stop them. The regime’s own armed forces shell residential districts of eastern towns, and bomb targets in densely populated city centers. No military intervention in these regions by armed forces of the Russian state has yet been demonstrated. Yet the Fourth International statement in its opening section posits a Ukraine “held hostage between the pressures of Russian and Euro-Atlantic [NATO] imperialism”. In its conclusion, the statement calls for a “withdrawal” of Russian military forces. The statement says not a word about the NATO military build-up in eastern Europe or the training and equipping by NATO of the Ukrainian armed forces. A June 12 article by the NPA accuses Russia’s president Vladimir Putin of “aiding and abetting the pro-Russian separatist [sic] uprising in the provinces of Donetsk and Luhansk”. As many news reports and analyses make clear, it is simplistic and misleading to describe the political uprising in eastern Ukraine as “pro-Russian separatist”. The people of that region have a variety of views on their political future; despite the war, many still favour some form of autonomy status with Ukraine. The main duty here for Marxists is to defend the right of this people to freely choose their future without being bombed and attacked or threatened with economic reprisal. In a particularly dishonourable section, the June 8 statement calls the massacre by right-wingers and fascists of more than 40 anti-fascist demonstrators in Odessa on May 2 a “drama”, moreover, that served to incite a “radicalisation of anti-Maidan propaganda”. The statement’s characterisation of the protest movement that came to a head on the Maidan square in Kiev in February is superficial and incoherent. It notes the movement was “a combination of revolutionary (democratic, anti-elitist, self-organized) and reactionary elements”, and regrets that “the movement has not expressed social demands; it has done very little to mobilize the industrial working class”. The only “program” of the movement, the statement says, was to secure the overthrow of elected Ukraine president Viktor Yanukovych. No attempt is made to proceed beyond these disconnected generalities and to analyse the movement’s class composition. The Maidan program consisted of much more than the demand for the removal of Yanukovich; equally central was the demand that the Ukrainian government sign onto the economic association agreement offered by the European Union. That this agreement would be accompanied by harsh austerity terms was never any secret. Sounding echoes from last year’s political tragedy in Egypt, the statement goes on to lament that the overthrow of Yanukovych in late February was“hijacked” by far-right forces. But this hijacking should not have been a surprise when the movement lacked any important working-class component and embraced neoliberal perspectives. Indeed, a far-right hijacking was precisely the goal of many of those who joined and led the movement, and certainly of those among the economic elite who financed it. The Euromaidan is…a movement initiated and controlled by the largest oligarchs. Its political base consists of radical nationalists and to a lesser degree of pro-Western liberals, while its social base is made up of petty-bourgeois and declassed elements. By contrast, the resistance movement in the south-east is more proletarian in its composition, as independent observers have noted. Nor is it an accident that resistance to the junta of oligarchs and Nazis that came to power as a result of the Maidan has appeared primarily in the most industrially developed regions, where there is a preponderance of the working class in the population. Articles by other members of Borotba have effectively explained that the way to win working-class sections of the Maidan movement to a progressive program is not by pandering to their illusions in European capitalism or to the reactionary dreams of right-wing Ukrainian nationalism but instead by projecting a united struggle for progressive social and economic goals. The Fourth International statement criticises Borotba for opposing the reactionary demands of Maidan and for standing outside it. But the statement ignores the fact that the ascendancy of fascist and other rightist groups on the Maidan square, and increasingly throughout the country, closed off the political and physical space in which this resistance might have been mounted. Meanwhile, the statement says not a word about the role Maidan should play in present circumstances. In reality, whatever progressive impulse may once have existed in the Maidan movement has long since been forcibly pushed aside or silenced. The challenge today is to win the working-class movement across Ukraine to the kind of anti-austerity, pro-democracy sentiments that are animating the autonomy movement in the east. On the deadly economic turn to Europe that Ukraine's rulers are making (with all the related consequences for military alliance with NATO), the Fourth International says hardly a word. The statement’s description of the goals and interests of Western imperialism in Eastern Europe is near to indecipherable. But on Russia’s role, the statement is very firm. The Fourth International dismisses the plebiscite vote in Crimea in March to secede from Ukraine, arguing unconvincingly that the vote was not representative of mass opinion. Not a word is said about the threat of a Kyiv-sponsored civil war that convinced so many Crimeans to vote in favour of association with Russia. The plebiscite and the events surrounding it are written off as “annexation” by Russia. Throughout the statement, we find a willful or naïve downplaying of the rightist and fascist danger in Ukraine. There is no mention of the role played by the extreme right in the government and in organising militias. Nor is there any mention of the attacks on democratic rights, including the trashing of the offices of left-wing and working-class organisations such as Borotba, the violent attacks on people attempting to hold protest demonstrations, and so forth. The statement’s very last sentence says: "In the nationalist camp, there are emerging currents that, taking advantage of the marginality of the socialist left, wish to appear in the eyes of workers as an alternative to capitalism." But the “emerging” of the rightists took place spectacularly last year and early this year. They have since become firmly established. Let us hope that in the coming weeks, wiser counsel prevails in the ranks of the Fourth International and that it joins in the anti-fascist campaigning now initiated by bodies such as the Solidarity with the Antifascist Resistance in Ukraine group in Britain. [Roger Annis resides in Vancouver Canada and publishes the website A Socialist in Canada. Renfrey Clarke resides in Adelaide, Australia, where he is a member of the Socialist Alliance. He translates articles from Russian for Links International Journal of Socialist Renewal. There are currently three ministers from the extreme-right Svoboda Party in a 19-member cabinet. None of them have any direct sway over the “power ministries”-- defence, security, law enforcement, justice. There are no Right Sector ministers in the government. The military campaign against the autonomist movement in the south-east is controlled or at least heavily influenced by an individual with a history as a fascist--Andriy Parubiy. He is secretary of the National Security and Defence Council of Ukraine (not a cabinet post). He was a co-founder in 1991 of Svoboda, known at the time as the Social National Party of Ukraine. He is now a member of the Fatherland Party along with of Prime Minister Arseniy Yatsenyuk and former prime minister and defeated 2014 presidential candidate Yulia Tymoshenko. All the leading figures of the government regime in Kyiv are extreme right-wing politicians. They all endorse ruthless military violence against the autonomist movement in eastern Ukraine. And none have done anything to stop the fascist gangs.